Activation Mode provides a way for you to ensure your visitors see or complete certain preliminary content before being allowed to browse more freely on the kiosk. Examples might include agreeing to a use policy or being asked to complete a short survey prior to being allowed to use the kiosk. During Activation Mode, Kiosk Pro hides the status, address, and navigation bars so that the only way a visitor can move forward is through links defined in your content. When Kiosk Pro loads a page where this variable is not defined (or is not == '1' or 'true' or 'yes'), the app will leave Activation Mode and begin running in standard kiosk mode. Any on-screen bars that are enabled in Kiosk Pro settings will then be shown. If showing the Navigation Bar, the Home icon will return the visitor to the first page shown after leaving Activation Mode and the back button history will end at this page as well. This prevents the visitor from accidentally returning to Activation Mode, where they would need to re-navigate through the preliminary content to continue browsing. With that said, the Idle Time Limit runs in both Activation Mode and standard kiosk modes and in either mode will return the kiosk to the Homepage set in Kiosk Pro settings, resetting Activation Mode. You may want to consider using the Show Idle Time Reset Alert function to let visitors know that the device is about to idle time out. Unlike the idle timer, the Browsing Time Limit timer isn't started until the app enters kiosk mode. If you choose to set a Browsing Time Limit, you must set an Idle Time Limit. For more details, please see Browsing Time Limit. This time limit allows you to specify how long you want your visitors to be able to use the kiosk. When the time limit is up, it directs the visitor to a Custom Page for Browsing Time Limit Reached to encourage them to walk away so another visitor can use the kiosk. This feature must be used in conjunction with the Custom Page for Browsing Time Limit Reached, and an Idle Time Limit must be set. 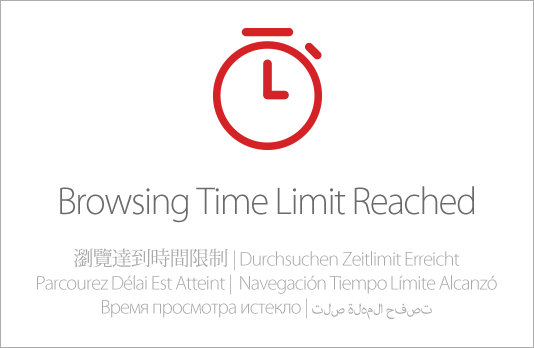 The Browsing Time Limit starts when a visitor first touches the screen, and continues for as long as the visitor is interacting with the screen. If the visitor walks away and the Idle Time Limit triggers, the Browsing Time Limit will be reset for the next visitor session. This feature is ideal for a busy kiosk situation like a trade show where you may want to limit each visitor's time on the kiosk. This option is used in conjunction with the Browsing Time Limit and allows you to specify the web page that the visitor will be sent to once the Browsing Time Limit event occurs. Touch gestures are not supported on the Custom Page for Browsing Time Limit Reached and an Idle Time Limit must be set to return the kiosk to a functional experience for the next visitor. By default this setting is blank, which means Kiosk Pro will take the visitor to a standard page which states "Browsing Time Limit Reached," in several languages (as seen below). If configured with a URL or local file path, the page specified will be displayed upon completion of the Browsing Time Limit (for URL format examples, see the Homepage article). As touch gestures are not supported on the Custom Page for Browsing Time Limit Reached, we suggest creating a page design that makes it clear to the visitor that the page is non-interactive. Having no means to leave the page or follow any links, the current visitor will walk away. Eventually the Idle Time Limit will take the presentation to the homepage, where the next visitor can get a chance to use the kiosk.